Diane Ackerman always finds a way to turn science into poetry, and this book is no exception. With a Sagan-like lens that can zoom out to space, back in time, and down to the microscopic, she analyzes what drastic changes humans have brought to the earth in our relatively short time here, beating the environmentalism drum but also offering offbeat explorations, beautifully poetic insights, and more hope and respect for the ingenuity of humans than many other doomsayer conservationists. An entertaining and inspiring read. 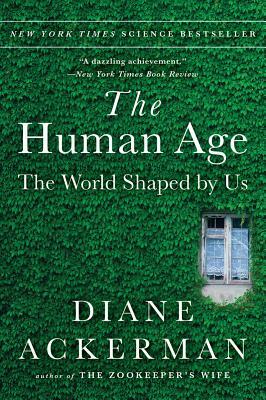 With her celebrated blend of scientific insight, clarity, and curiosity, Diane Ackerman explores our human capacity both for destruction and for invention as we shape the future of the planet Earth. Ackerman takes us to the mind-expanding frontiers of science, exploring the fact that the "natural" and the "human" now inescapably depend on one another, drawing from "fields as diverse as evolutionary robotics...nanotechnology, 3-D printing and biomimicry" (New York Times Book Review), with probing intelligence, a clear eye, and an ever-hopeful heart.